Myrath: Tunisian metal monarchs drop spectacular new video! Tunisian metal masters, Myrath will release their incredible new album Shehili via earMusic on May 3rd. 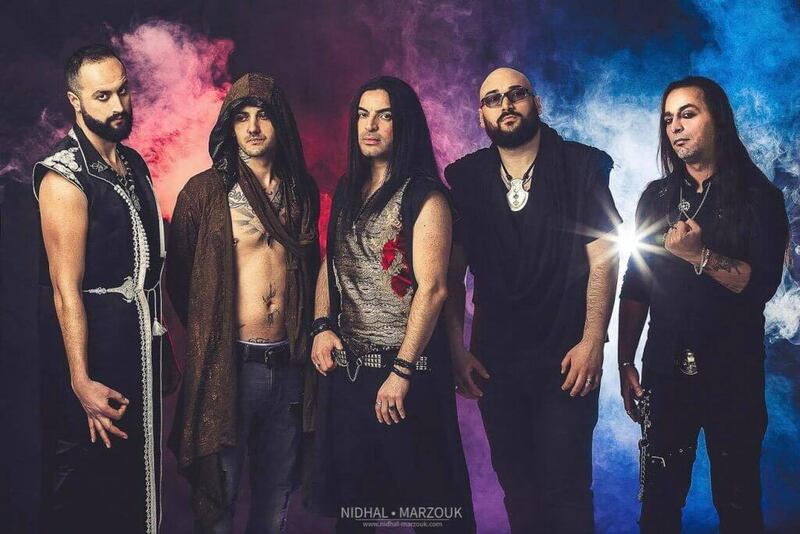 The powerfully melodic single No Holding Back is another intoxicating track representing the band’s “Blazing Desert Metal” with Myrath as the trailblazer and standard bearers of that new exciting genre. The impressive clip takes the viewer back into the enchantingly exotic world of adventure, that, through the previous videos of Believer and Dance, has been an integral stepping stone in their band establishing themselves as one of the most fascinating bands in the current international metal scene. No Holding Back is the cinematic grand finale in the trilogy surrounding the three videos. It is the final instalment of a tale that shows the band members as avatars fighting for a peaceful world and for those who stand up against oppression in a world full of uncertainty. No Holding Back shows that the band not only displays a high sense for wonder and storytelling, but their undeniable musical finesse and ability to combine powerful melodies with strong lyrics stands obvious above all. Although the Tunisian republic is quite a recent state (established in 1957), its history is very ancient. The Carthaginian Empire which challenged Rome was born in the ninth century BC, created by the Phoenicians from what is now The Lebanon on lands originally inhabited by Berbers. Due to the geographic situation of the Gulf of Tunis, Carthage became the dominant civilization in the Western Mediterranean. Carthage was defeated by Rome in 146 BC, who renamed Carthage to Afriquia thus giving the continent to the south of the Mediterranean it’s name. The Culture of Tunisia (as its inhabitants) is mixed and diverse due to its long established history of outside influence from people – such as Berbers, Phoenicians, Romans, Vandals, Byzantines, Arabs, Turks, Italian, Spaniards and French – who all left their mark on the country. No wonders, then, that Myrath is producing such diverse music and that they chose Carthage for the setting of their first upcoming DVD. Tunisia is a Republic and considered to have the most modern constitution of the Eastern World. Nevertheless during the years from its independence to the Jasmin Revolution it was, as the Guardian quoted it “one of the most modern but repressive countries in the Arab World”. Dictatorship and corruption was the rule until, on December 17th 2017, Mohamed Bouazizi, a twenty six year old Tunisian street vendor set himself afire in protest at the confiscation of his wares and the humiliation inflected on him by municipal officers. It was the catalyst for mass demonstrations, of an intensive campaign of civil resistance which led to give the people their freedom back and the Ben Ali family to exile. This Jasmin Revolution was the epicenter of a movement which spread to Egypt, Libya, Syria…and changed the face of the region. As citizens, the members of Myrath took their part in this Revolution and during the recording of Tales of the Sands (2011) they had to literally fight to defend their neighbourhood against looters and repressive forces in a chaotic post-revolution Tunisia. Of course the Revolution haven’t solved all the problems and the democratic process is still developing, but so far, the country is pacified and strongly anchored in the modern world, freedom of speech is a reality and women have their share of the new freedoms. All communities live in peace, with a strong pride in having won their freedom, staying alert in order to not let any dictatorship (laic or religious) rise again. How odd is the sentence : “Myrath a Tunisian metal band”? Could you imagine, knowing the context, the self-confidence, the mental strength, the power of will that the band must have had to rise up and become today one the most fresh and respected newcomer metal bands in the world ! Tunisia, like many African countries (except South Africa) doesn’t have rehearsal places, rock music schools, venues or even proper recording studios. On top of that in most Islamic countries, Metalheads are perceived as devil worshippers. In 2003, in Morocco a trial lead to jail for metal fans and musicians. Since then, situation has improved and changed, but back then, creating a metal band in those countries was an act of faith and with the number of problems faced it seemed impossible to succeed. On July 19th 2018, Myrath gathered seven thousand fans in what is still today the biggest metal show to take place in Tunisia, in the sumptuous Roman amphitheatre of Carthage. Myrath now is not only perceived as a music band in Africa, but as a beacon of hope for many musicians who follows their trails. They have shown to the world that if you believe in your dreams and work hard to stick to it, no matter the odds, anything might happen! They very well deserve their name, which means Legacy.